Thank You for posting this early Christmas Giveaway to your followers.. I should own this awesome stuff for an early Christmas gift + advance birthday gift as well.. I'll be turning 36 on Dec 13... yay! i'm a follower as anshita. i should win this because i love this beraded bracelete and found something like this in a mall but the moment i was going to buy it..someone else got it!!duh! n i love the shorts and earings soo much. Hi Sis! I want to win this give away because I want to look even more fab and glam wearing this fashionable stuffs specially this Christmas. -Followed you thru Google Connect with username "kayeshayne"
Thanks so much sis for hosting this giveaway..
Hi sis, thanks for the heads up! I think I need to win this to save me lottsa shopping money this Christmas. Having stuff for yourself, especially if its free is an awesome feeling. Posted your giveaway badge on the side bar of the above blog. God bless you more for your generosity, thanks for hosting this giveaway. I deserve to win this loot since I barely spend anything on myself for Christmas. Getting freebies for myself would be a welcome change and would make my holidays a memorable one! I think I need to win those Fabulous prizes as a gift to myself and to my sister as well this coming Christmas. Hi! I think I need to win this because times are hard and I need free stuff to help me glam up for Christmas. -Followed you through Google Connect with username "citygirl"
Hello sis! I would love to join your giveaway. I think I should win this giveaway because I wanna glam up myself for Christmas. -Followed you thru Google Connect with username "garychie"
I'm your newest GFC follower. I have no real reason why I should win other than that's some cool stuff! i would love to win this because there are many great prizes! I especially love the earrings and nail polish. :) I want to win this giveaway simply because I want to look fashionable with this stuffs and to serve as an early christmas gift. -subcribed to Pink MagaLine in facebook & tag and shared it to my friends there. I want to win in this giveaway as a Christmas present for myself. If so, this will be my first time giving myself a Christmas present. 1. I liked the Pink MagaLine page. 2. 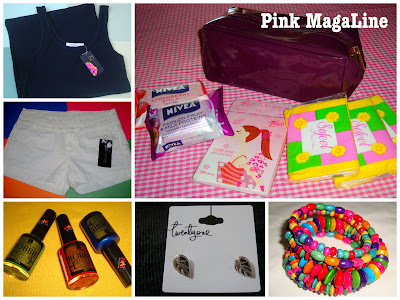 I shared the Pink MagaLine giveaway link. 3. And I tagged Pink MagaLine together with my shared link. Follower of your blog as divine_viva. I deserve to win because I've been working hard and I love freebies and it's a nice way to treat myself to Christmas freebies. Hi there, I want to win this giveaway because I find the prizes cool and these items will make my look different. 1. Liked/Subscribed the Pink MagaLine page. I need to win these because I want to look amazing for Christmas. Blogged, displayed your giveaway button on my blog and added Pink MagaLine to my link list. I would like to win because I need some new to add to my wardrobe. I follow as Ashley Hewell.